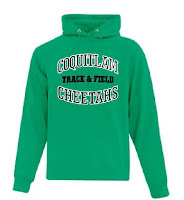 Coquitlam Cheetah t-shirts and hoodies can be purchased from the Coquitlam Cheetahs Online Shop. The new addition to the cheetah collection will be the green Cheetah hoodie (Image Below). The shop will close April 30th, midnight. Payment is by credit card. All purchases must be made by April 30th (no exceptions) with tees and hoodies to delivered before the end of May.